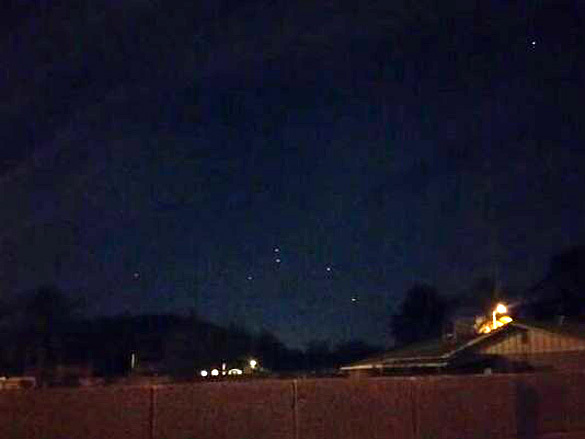 Orange balls of light were seen by several people over Phoenix, Arizona on Easter Sunday. A couple of those witnesses caught the objects on video. Arizona’s 12 News interviewed Peter Perez, who says he and his family saw the objects just before sitting down for Easter dinner. Perez says his step-father saw them first and called the rest of the family over to take a look. The story on AZCentral.com says the sighting took place on Saturday. However, Perez says it was Easter, and later in the story, they mention the sighting was on April 5, 2015, which was Easter. The Saturday thing must be a mistype. Either way, Perez says it was about 8:51 pm when his step-father pointed out the lights. Perez said the area they came from was obstructed from his view. According to Perez, the lights hovered in a group, stationary, for a minute before moving off to the west and disappearing from view. After losing sight of the objects, Perez stayed outside for a few minutes. He then saw a second group of lights moving similar to the first. Perez said the second group was smaller, about 10 lights, he estimated. Perez caught a few seconds of video, which can be seen above. 12 News talked to a second witness, but that witness wanted to remain anonymous. This witness also took pictures, but they were not provided in the 12 News story. However, Perez was able to look at them, and he says they were similar to what he saw. Another witness to the lights is a bit more of a UFO Hunter. YouTuber TimTheBall posted video of the lights he says he captured on Easter Sunday at about 9:05 pm. He has several other UFO videos posted on his YouTube page as well. TimTheBall’s description of the UFOs is very similar to the description given by Perez. 12 News asked viewers who may have seen the UFOs on Easter Sunday to comment on their Facebook. At least one other witness was convinced that what she saw were Chinese Lanterns. Many agree. Similar comments have been made on TimTheBall’s YouTube video. “I didn’t claim they are ET, but it is a UFO,” he added. Chinese Lanterns can look strange. They can go from a slow pace to a fast one if caught by the wind. They also are often amber in color, and they are used most often on holidays, like Easter. So the debate continues. Take a look at the video and let us know what you think. Better yet, if you were a witness, let us know what you saw. I am an ASU student, normally, I would not acknowledge a story such as this as credible. However, I have to say, I am now a believer . My wife and I just returned from the DMV in Avondale, from which we were showing our daughter how to parallel park. Upon our drive home we saw the same thing on Friday April 1st around 8:30 or 9:00pm. I , we saw one huge descending object that looked like a meteor and then suddenly broke apart into 5 or 6 individual pices. The pieces suddenly changed direction, flying vertical to form a triangle. The pieces then reordered themselves into a straight line and began travelling in different directions. We took a video, but the only thing captured was our reaction because the objects were too far for the lense to capture. At first we thought it was a meteorite, eventually we concluded that it was something unidentified, or maybe a secret military program being tested. I honestly don’t know what it was, but I’m leaning towards a military project because it would ideally be the time to showcase or use such a project, on April 1st, only because nobody would believe the story because it took place on April 1st.